A hero story has three parts: origin, conflict, and resolution. 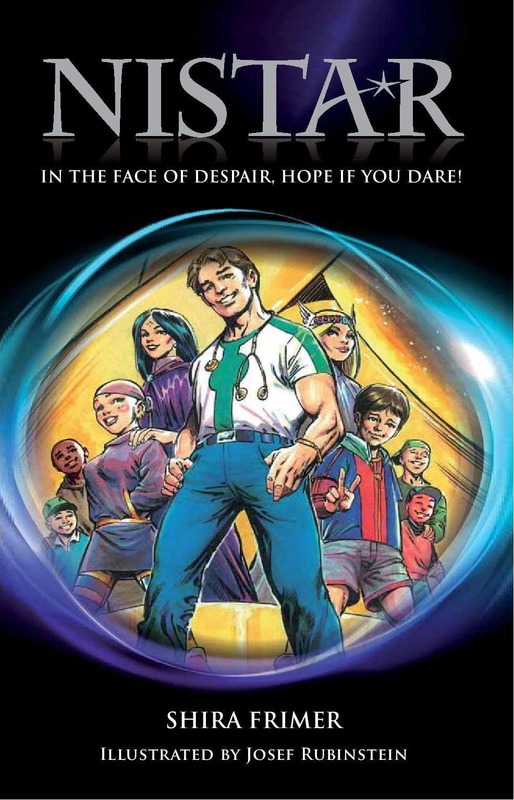 Nistar, the 2013 graphic novel by first time comic book author and expressive arts therapist Shira Frimer, with art by Joe Rubinstein, is a hero story. All the elements are there. We have our hero in Dr. Jacob Barak, an emergency medicine physician. We have our origin story explaining how Dr. Barak obtained his superpowers. We have our conflict in Dr. Barak trying to defend a young child against an evil force flanked by a dark army. We have our resolution with our hero saving the child and even getting the girl. Within the structure of the comic hero myth, Nistar doesn’t tread new ground. And there have been comics before, to be sure, that have dealt with the subject of cancer, from “Cancer Vixen” to “Our Cancer Year” to “Mom’s Cancer.” But while those titles braved the bitter reality of medical oncology face-forward, Nistar reimagines malignancy, tumor staging, and chemotherapy as mind spheres, magical invisible stones, and energy fields. It is, in every sense of the word, escapism. Escapism has, of late, incurred a negative connotation. It suggests an inability to deal with reality, and an unwillingness to confront fundamental issues in one’s life. But when painful experiences are reappropriated in a constructive or reflective manner, escapism plays a powerful, essential role in creating a hero myth. This myth can often reverberate louder than reality. Superman’s origin as an infant Kal-El escaping an imploding planet Krypton is often cited as creators Jerry Siegel and Joe Shuster’s meditation on the Jewish immigrant experience in America. George Orwell’s dissection of Stalinist Russia in “Animal Farm” wouldn’t have had nearly the same impact on literature had humans been the main characters in the novel. Imagine you are a teenager whose partner got diagnosed with Ewing’s sarcoma, a rare pediatric malignant bone cancer. Imagine you became engaged and married to him the year afterwards, and he completed a year of law school before having to receive full, long term chemotherapy in a hospital. Imagine that same husband, while in the hospital, devoted his time to entertaining patients in the pediatric oncology ward instead of mulling over his own health. Imagine him dying three years later. How would you cope? How would you move forward? Would you use this painful experience as inspiration for a comic book story? Would you seek out an organization started by two parents whose son was also diagnosed with Ewing’s sarcoma? Would you join forces with this organization to raise enough money to distribute five thousand copies of this comic for free to U.S. hospitals nationwide? Would you employ the artistic talents of a legendary comic book inker with over thirty years experience to illustrate your story? Would you do all of this to honor your husband as the hero he was? Now re-examine the seemingly simple hero tale of “Nistar.” The main character Dr. Jacob Barak is diagnosed with Ewing’s sarcoma early in the story. But a potent invisible stone called the Tzohar imbues him with super speed, intelligence, and cures him of his cancer. He befriends and must later save a child named Ben with Acute Lymphoblastic Leukemia by venturing into a dream world where malignancy and tumor infiltration can be defeated with courage, physical strength, hope, and the power of Light. Dr. Barak, in the end, saves Ben, with a solution that is truly astonishing in the way that it links fantasy, myth, and reality. Where Shira Frimer’s husband had only a limited time to be with the children in his pediatric oncology ward, his memory, through Dr. Barak’s heroic tale, could help children and families forever. How do we judge art? Many argue that art, in whatever form, should exist and be critiqued independent of real life. Independent of operator. Independent of the circumstances in which it was created. But that implies that art critiques could ever approach objectivity without bias, and that there is no added value in exploring the line that blurs art and life. In the 1999 P.T. Anderson film “Magnolia,” Jason Robards plays Earl Partridge, a television magnate suffering his last days of metastatic lung cancer. Should it not matter that Robards himself was in his final throes of his own lung cancer, and that some of his final words were uttered in that movie? Should it not matter that all of the air traffic control characters in the Paul Greengrass movie “United 93” were the actual air traffic engineers working on September 11, 2001? In certain cases, ignoring the artist when examining the art can be a missed opportunity, and at its worst, irresponsible. “Nistar” is not a perfect graphic novel. Shira Frimer has created a fantastic superhero story that occasionally suffers from pacing issues, most notably in the second chapter as she understandably rushes to the truly incredible resolution. Joe Rubinstein, whose art in this book hints at the best ’90s work of Mark Bagley’s Spider-Man and Greg Capullo’s X-Factor, seems less comfortable in the amorphous dream-world than in the tangible world of the hospital. But to nit-pick at technical issues in execution would belie the astonishing, overarching accomplishment of author, artist, publisher, and benefactors who made this comic book tangible. “Nistar’s” success lies in the fact that it even exists.